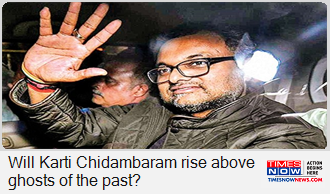 #LokSabhaElections2019 | At 48, Karti Chidambaram is into his eleventh election. Karti Chidambaram almost doubled his liabilities in the last five years, his poll affidavit shows. Giving Lok Sabha ticket to Karti Chidambaram is proving to be dangerous for Congress. Inside scoop from Congress camp. How Karti bagged a ticket? Was Congress President Rahul Gandhi confronted? Who convinced Rahul? INX Media money laundering case: ED attaches properties of Karti Chidambaram worth Rs 22 crores. | @Sn3haAgrawal with details. @nimumurali with more details on #18DegreesSouth with @Zakka_Jacob. Karti left the CBI office after almost eight hours of questioning. Called again on 28th Aug.